Meet Digiperformer Mansi Yadav, BBA graduate from GGSIPU and currently working on various projects as a Freelancer. After graduation, she realized the importance of digital marketing and decided to learn the same. In a chit-chat session, she shared why she decided to learn digital marketing and choose dCDMC training at Digiperform. Mansi- Hi I am Mansi Yadav, a BBA graduate and now a certified Digital Marketer. After doing graduation I wanted to boost my skills. I explored several alternatives and found digital marketing as a prominent option for me. Mansi- The growth of online marketing and the increasing importance of digital platforms such as social media, made me choose digital marketing as my career. I always believed in changing weaknesses into strengths and by choosing digital marketing as my career; I overcame the fear of social and digital platforms and built a lot of confidence for such platforms. 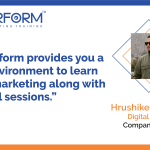 Mansi- The demo class at Digiperform persuaded me to choose Digiperform over the other online marketing training companies. I liked the friendly (not so strict) nature of the trainers that gave us the comfort to practice and ask queries based on the course. Mansi- I loved my training period because initially I always been worried about whether I would be able to be a digital marketer or not. However, the trainers made all the learnings easy to understand and sessions smooth to perform which lead me to feel more confident than before. Mansi- Digiperform is definitely a trusted & reliable resource for me as they have always helped me out with my queries and issues, during as well as after the training period. They were always there whenever you needed help. Mansi- I would give Digiperform, happy 10 on 10. Mansi- In next 5 years, I see myself as an SEO expert because I am really good at writing SEO content blogs and absolutely love how the ranking of my articles are improving on the search engine result page. This gives me a boost to work harder. Mansi- I would just say that “if you really want to do this, don’t think too much, go for it and give your best”. Mansi- A best friend for wannabe digital marketers!! Thanks a lot, Mansi for sharing your valuable experience with us. Best of luck in your future endeavors.